In order for an older stove's oven to operate correctly, the pilot must remain lit at all times. When you turn on the oven and turn the temperature dial to a predetermined temperature, the pilot flame gets bigger. The larger flame heats the tip of the thermocouple, and the thermocouple sends a signal to the gas control to release gas to the burner, lighting the burner and heating the oven to your desired temperature. If the pilot light goes out on an older gas stove, you must manually relight it. Keep the oven working by ensuring the pilot remains lit. Turn the oven dial to the "Off" position. Turn the temperature dial to the "Off" position if your oven has separate controls. Open the oven door. Remove the broiler pan from the bottom of the oven to expose the burner and the pilot. Light the oven pilot light. Use a barbecue lighter or a long fireplace match to reach the pilot located at the back of the oven burner. Test the oven burner by turning the oven dial to the "On" position. Turn the temperature dial to 250 degrees or higher. The burner should light within 1 minute. Turn the temperature dial to the "Off" position and turn the oven dial to the "Off" position. 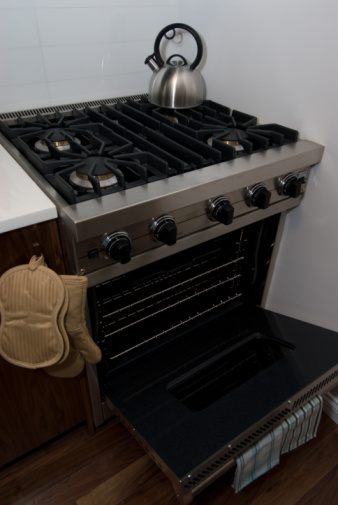 Replace the broiler pan and close the oven. How Does an Oven Thermostat Work?